Over the last couple of years, the main challenge to EU cohesion has been Brexit, with the media sharply focused on the negotiations and all relevant developments. Since the release of the draft withdrawal agreement, largely perceived as a victory for the EU, those who support the European project and believe in a strong leadership from Brussels have projected confidence and optimism for the future. According to these voices, the divisions caused by the rise of nationalism and populism in the past years are healing, the relationship between member states is normalizing, while a future of stability and harmony awaits. Belgian Economist François Denuit suggests introducing the euro-dividend as a new pillar of social rights on which member states could build up their own basic income policies. A big leap forward towards building a truly and ambitious Social Europe. ANGELA Merkel has refused to give up on her ambitious plans for the European Union and has pledged to push forward her relaunch plans. 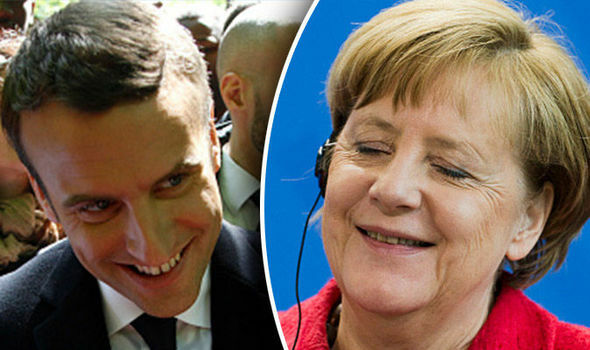 German Chancellor Angela Merkel said she will use close cooperation with Emmanuel Macron to restart the European Union and shape the continent’s future. The beginnings of the United States of Europe, courtesy of a German Fourth Reich which dominates the European Union to serve its own purpose. The leaders of the lower chambers of parliament of Germany, Italy, France, and Luxembourg have called for a European “Federal Union” in an open letter published in Italian newspaper La Stampa on Sunday. In less than a month, on March 17 next, we Presidents of the national parliaments of the EU we will meet in Rome, how will the representatives of governments, for the sixtieth anniversary of the Treaty from which it began: our Union. Europe’s prestigious Charlemagne Prize for promoting unity goes to the pope—an important sign of what’s to come. That news will come as no surprise to those familiar with theTrumpet.com. For years we have said that the Catholic Church must play a powerful role in European unity. Few see the signs of the Vatican playing this role, so far. Many of Europe’s modern leaders are from Europe’s very secular, multicultural left. But now, as Europe is becoming increasingly desperate for unity—with the euro, the border-free Schengen zone, and even the European Union itself under threat—we’re seeing more signs that it will look to the Vatican. Will Western Civilization Survive the European Project? Comments Off on Will Western Civilization Survive the European Project? Posted in Civil Unrest, Europe, European Union, Germany, Government Corruption, Islam, Middle East, National Security & Terrorism, Politics, Syria, The Fourth Reich, USA Tagged angela merkel, EU, EU-dictated quotas, europe, European project, European Union, Germany, government corruption, Islam, Middle East, migrants, National Security & Terrorism, national sovereignty, new Europe, Poland, political upheavals, refugees, social unrest, Syria, The Fourth Reich, United States, Western civilization, Will Western Civilization Survive the European Project? European leaders gave Greek Prime Minister Alexis Tsipras a straightforward choice: ditch his principles or quit the euro. Tsipras was presented with a laundry list of unfinished business from Greece’s previous bailouts at an emergency summit that stretched in its 14th hour by 5:59 a.m. Monday in Brussels. Euro-area chiefs gave Tsipras three days to enact their main demands to keep alive chances of adding bailout funds of as much as 86 billion euros ($96 billion) to earlier commitments of 240 billion euros. Thanks to this promise — a referendum on Britain’s membership in the European Union — and that Britain never adopted the euro as its currency, Britain’s Prime Minister David Cameron was the only sitting European leader not punished by the voters. Everywhere in Europe, electorates have lost confidence in the bureaucrats of the European Union in Brussels and those of the European Central Bank in Frankfurt. They want once again to be empowered to decide their own political and economic fate. Alexis Tsipras warned on Tuesday that the failure to agree a rescue deal for Greece would spell the end of the eurozone as he submitted a revised package of reforms to negotiators in Brussels. Merkel wants a braver Germany. But will the German people let her have it? In addition to a push for a ‘United States of Europe’ lead by Germany via the EU and its control over the ‘Troika’, calls for a ‘European Army’ have already been made in the past by member nations such as Poland and Italy. What may seem like science fiction or a joke nobody will take serious today is tomorrow’s reality, and as the addage goes: the truth is stranger than fiction. Although a lot of EU nations don’t like each other at the moment, the further integration of iron and clay (Daniel 2:43) continues to be their only solution. With Italy’s high involvement, and even with the Vatican, it’s reminiscent of the WWII era connection between the church and the German leadership. Or better yet, the Holy Roman Empire of the past. Look for calls of a European Army to grow, especially as resurgent Russia is on the doorstep and the United States is suicidally fading away from the world stage. As with all nation building, the political structure comes first, then the economy. After the economy comes the military. The Fourth Reich is coming. Matteo Renzi, the Italian prime minister, has said that Italy will push for a “United States of Europe” during its six-month EU presidency, in a move likely to raise hackles in Britain. He further called for “courageous leaders” to work towards achieving that goal – something that Britain has always objected to. In 1988 Margaret Thatcher, then prime minister, dismissed the idea that the United States might be a model for the future of Europe and David Cameron is actively trying to prevent the election of a committed federalist, Jean-Claude Juncker, to the head of the European Commission.